In this review we are going to take a look at one of the new comers to the offshore Pay Per Head industry. 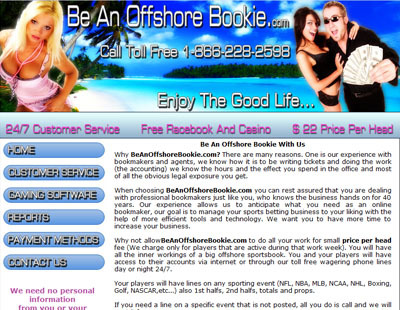 Beanoffshorebookie.com is one of those companies that jumped on the PPH bandwagon back in 2007 and, so far, has survived the carnage that saw many companies quickly go out of business due to lack of experience. This is a reality in any type of business; celebrity chef Gordon Ramsay hilariously exposes incompetent restaurant owners with his show Hell’s Kitchen. Unfortunately there’s no one like Ramsey in Costa Rica who can help PPH shops that have no clue as to what they are doing. The problem with these companies is that they are run by people who may have worked in the business for years but don’t have the complete skill set to manage an entire sportsbook operation. As someone who has been in the business let me assure you that there is no cookie cutter formula that allows any sportsbook manager to just sit back and let people gamble willy-nilly. This business requires a proactive approach where line moves and technical issues are anticipated long before they actually happen. I am not saying that Beanoffshorebookie.com falls into the category of incompetent management. However, as a new comer they are still proving that they are capable of staying in the game for the long haul. They do not stand out in any particular category and, over all, my impression of them is that they are just another run-of-the-mill pay per head shop. They have all the basics covered in terms of products so your players will have access to sports, horse racing and online casino and it’s all run on the DGS software which is solid and reliable.